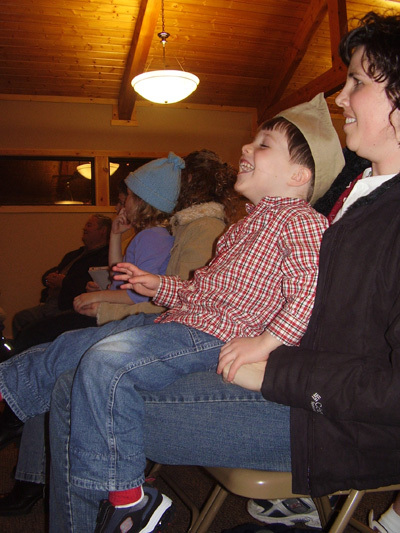 February 9, 2006 | In a room full of T-shirts and jeans, scout uniforms and big winter coats, one man stands out in a beaver felt hat, a red mountain man blanket vest, tanned leather pants and moccasins. Logan resident Robert Hoth, or Cut Blanket, has been practicing mountain man skills since he was a child. "Ever since I was 9 or 10 I started to learn to track from my father," said Hoth. "Even my grandfather learned to track." Hoth, now 64, is a member of the Old Ephraim Mountain Men, and regularly attends encampments and rendezvous. Old Ephraim Mountain Men, started in 1974, is based in Cache Valley and has about 35 members, half of them women. Longtime members have mountain man names, such as Cut Blanket, and newer members are called pilgrims. Hoth has been a member for more than 25 years. North Logan's Bill Lowry has only been a member for about two years, and is still a pilgrim. Lowry's involvement stems from his fascination with explorers Lewis and Clark. "My wife and I started looking at Lewis and Clark about two years ago," he said. "We concentrated on trying to get a feel for the objects they took with them." This love for history led to his involvement with the Mountain Men. "The emphasis for me is objects," Lowry said. "I guess I just like the history of the hardware." His collection of objects includes bullets, badger skins, a knapsack, and an 1803 Flintlock rifle. Mountain Men encampments take place once a month, and they have a rendezvous every Labor Day weekend in Blacksmith Fork Canyon. What do they do at encampments? "Have fun," Hoth said. "We learn new skills. We sleep in lean-tos and tents. We do beading and leather craft." On average, 25 people attend encampments, and 100 attend rendezvous, where mountain men can trade objects. Mountain men from around the state are invited to the rendezvous, hosted by the Old Ephraim Mountain Men. Other skills Hoth has developed include a heightened sense of smell. "I can smell people two-thirds to three-quarters of a mile off," he said. "There was a time when I was walking with my wife, and I said, 'there's a young lady up ahead,' and we got about half a mile up and, like I said, there was a bar girl." About seven or eight times a year Hoth is invited to speak on his experiences. Dale Ashcroft, zookeeper at the Willow Park Zoo, asked Hoth to come for "An Evening at the Zoo," an educational program the zoo hosts the first Thursday of every month. "I've seen him many times," Ashcroft said. "I've heard him and I've seen him interact with children. I knew it would be G-rated." The "Evening at the Zoo" is held in the zoo's new Wildlife Learning Center, dedicated last May. The big room slowly filled with scouts, adults, and the noise of children asking curious questions to Hoth and Lowry before the presentation began. Hoth invited Lowry to come, and the two spoke to an audience of more than 50 people. 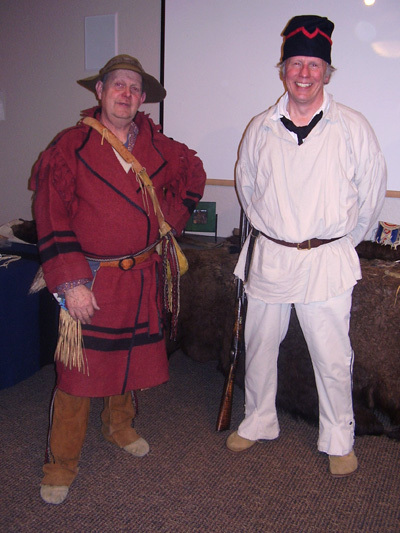 Hoth, dressed as a traditional mountain man, told accounts of Daniel Boone, Jim Bridger and other mountain men. Lowry, dressed in a Lewis and Clark costume he made himself, told stories from their history. They showed the audience different tools and clothing pieces, including a hatchet Hoth has used to clean out deer, and a black bear fur hat piece that Lowry keeps in his personal collection. Lowry said he "hasn't the foggiest" why he loves it so much, but that it was interesting to see what people 200 years ago were like.